This appetizer is my go to. I make these all the time because they are completely fantastic. I serve them with a meal as a side, I've probably made a billion and eaten a million in my lifetime. Seriously. They are low-carb, sugar free and have bacon, what more could you ask for? When cooked properly the jalapeno is roasted, soft and has lost much of its heat, and the bacon is crispy, even children like my poppers, it becomes the perfect bite. I like to make as many as possible at one time, I've even learned that they freeze fantastically and plan on having some on hand in the freezer at all times. 25 jalapenos, slice lengthwise then seeded and ribs scraped out. 2 packages of bacon - bacon slices cut in half. Take your jalapenos, and using a large spoon, fill up your jalapenos. Wrap your bacon around the jalapeno, trying not to overlap the bacon. Stick with toothpick if necessary, but I've found if you let the bacon sit on the counter and warm up a little bit it becomes pliable enough that it will stay in place. At this point you can place your poppers on a large tray and freeze until solid, then transfer to freezer bags, if you need to. When they cook on the wire rack the air in the oven can cook all the way around the popper - meaning no undercooked bottom - a serious no no for poppers! 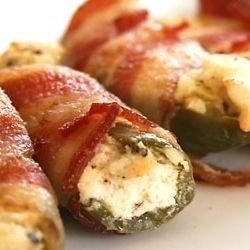 You can also place these poppers on the grill during the summertime - giving you the same result. Bake on cookie sheets for a hour. No joke, an hour. But don't let the bacon burn, if they darken too much lower the temp, they must cook enough that the bacon is nice and crispy AND the jalapeno has begun to gray slightly and the skin is shrinking away from the flesh. Otherwise you'll get the dreaded crunchy popper that burns the heck out of your mouth. My impatience has left this burnt resentment in my mouth often. 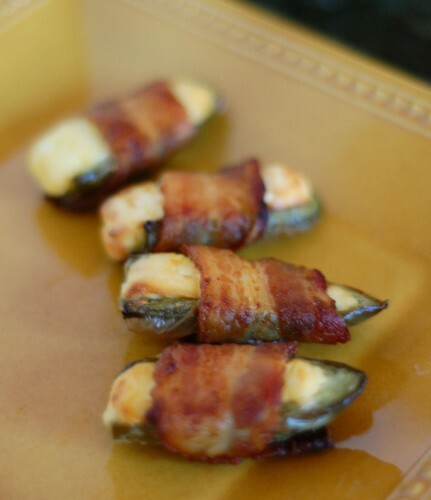 There you have it, beautiful simple and delicious jalapeno poppers that you'll be making for every event, even if its just tuesdays, for life. Enjoy! Yea finally!! Thanks for posting this and your secret weapon! :) best poppers ever. Can't wait to try them myself!! I'll let you know how it goes. Let me know how it goes... I sure they will be delish! There good this way. But take your cream cheese and mix it into 1 lb of pork hot sausage that you have cooked and drained. Then fill with the sausage and cheese mix. And wrap in bacon. I do these on the smoker for 1.5 hours at 225. We have done hundreds of these and there always a hit. Yum, that sounds delish! We just started smoking ours last summer as well, and that is my favorite way to eat them!